Shakespeare’s gem, “As You Like It,” is still going strong after nearly four centuries. The play hits all cylinders: strong characters, plot and themes, great comedy, and language that’s a treat for the ears, especially if one reads the play before seeing it. First published in 1623, the play was already at least 270 years old when the acclaimed Helena Modjeska starred as Rosalind in an 1893 production. 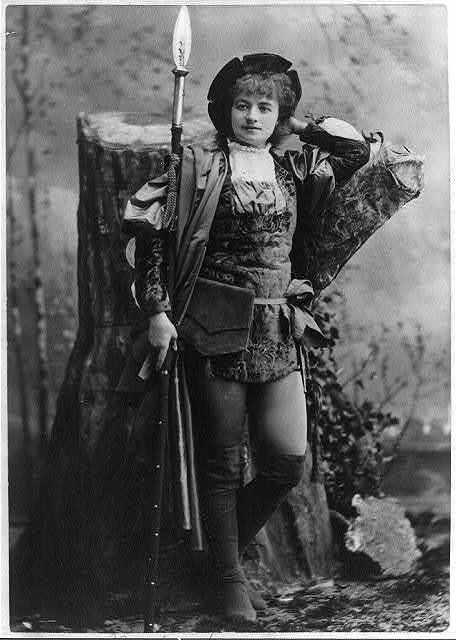 Helen Modjeska as Rosalind in 1893. I caught a performance of “As You Like It” last week at the Illinois Shakespeare Festival in Normal, Illinois. (The festival runs through August 11.) Gracyn Mix and Amanda Catania are superb in the roles of Rosalind and Celia, the two young women who dress up as men and flee a cruel duke by escaping to the Forest of Arden. Dylan Paul as Rosalind’s lover, Orlando, is also excellent. He and Mix have great chemistry on stage and, with Catania, carry the play. It’s funny. Reading the play, I laughed out loud at the jokes and puns, often thanks to the “clown” Touchstone who accompanies Rosalind and Celia into the forest. This play is full of satire and parodies that are best understood by reading the text. Believe me, Shakespeare is much more satisfying when the audience gets the jokes and knows when to laugh! It’s serious. One of many things Shakespeare does wonderfully well is presenting themes with contrasting plot elements that move the story forward. In expressing the play’s “love conquers all” theme, Shakespeare will use a tense, serious scene – when the life of Rosalind or Orlando is threatened, for instance – and then follow it with a comedic scene, all the while maintaining a steady pace and flow. It’s fascinating. Watching Shakespeare is like watching people that lived four centuries ago, resurrected before your eyes. This is how our ancestors thought, spoke and behaved. In some ways they are quite different from us − for example, they believed that “falling in love” resulted from beams shooting from lovers’ eyes and entangling with each other − and in other ways they are exactly the same. In this sense, Shakespeare provides a very interesting (and entertaining) history lesson – not just about language and culture, but about our very consciousness, showing us where we came from. It’s music to the ears. There’s a lot of music and poetry in “As You Like It,” and wonderful speeches such as the “All the world’s a stage” monologue given by the melancholy Jacques. The bonus is that Shakespeare also delivers parodies of songs and poems, almost as if he were making fun of himself. It’s relevant. “As You Like It” still connects with audiences with a message of hope about the magical power of love, which can transform even the cruelest of people. It’s a feel good play – there are no deaths, except for deer and a lioness that live in the forest. Shakespeare extends compassion even for the poor animals, sounding like an early animal rights activist. Maybe that’s part of the staying power of Shakespeare. He’s so ahead of his time he’s never outdated.